You can view some of the videos that came from the conference over at the ARTICLES section of LLTS.ORG. Suffice to say it was an amazing year. We had an amazing time with some amazing guests and built some strong relationships as a result of this year's event. Alienware sponsored a LAN party with donated machines. Prima Games and Playxpert held round tables to explore what players wanted from their products. Heatwave, KingsIsle and SOE all opened their doors to us for Studio Tours. There were product demos, play testing and feedback sessions of unseen (as of that time) products, contests and several closed door meetings not to mention our annual Charity Raffle which was an amazing success. 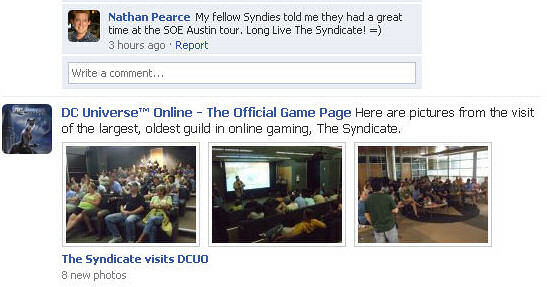 The 2009 Syndicate World Conference was our largest and most successful event to date. Thanks to all of our guests and members who attended. See you in 2010!